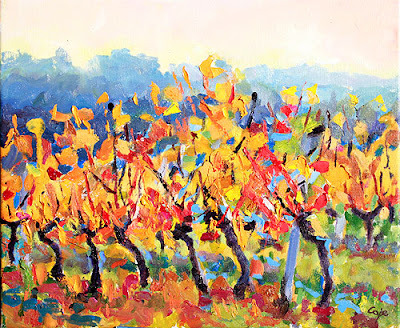 pein-air = sur la motif, sur la vif, on location, on the spot , from observation in the field, sometimes called wrongly called ‘impressionism’ as the Impressionist are the bets known school of plein-air painters. Truth is a funny matter in painting. For the most part, I start off from observation, and an idea of what I want to express. For a plein-air painter, finishing off in the studio is a delicate affair. How far away from one’s first impressions should one go? How many edits & cuts & rethinks? Often, what one really wanted to say gets lost in these changes of direction. Lost & left to one side. Alla Prima first-takes do have the advantage of freshness & simplicity. OK maybe they can never have the depth of a painting that has taken years to achieve. But where is ‘truth’ in a painting? If one arrives somewhere close to what one wanted to paint in the first place, then that’s going in the right direction. What I’m currently saying to myself is to watch out for the junction-point when a painting becomes another painting , so what one is in fact doing is painting another painting over the top of the first lay-down. Why not just paint two paintings, different but one leading on from the next? i.e . work in a series.